I love seeing how different authors and artists cover the same subjects & stories. Here we've got last year's The Girl Who Ran by Frances Poletti and Kristina Yee, and this year's Girl Running, by Annette Bay Pimentel. Both cover Bobbi Gibb's groundbreaking run in 1966—in which she became the first woman to run the Boston Marathon despite her official application being rejected because, as the race director phrased it, "women aren’t allowed, and furthermore are not physiologically able." She ran again in 1967 and 1968, unrecognized, but with—again, according to the backmatter in Girl Running—more and more other women joining in. They both cover some of the same details—her love of running outdoors; how she drove around the country and trained, trained, trained; how women's running shoes literally didn't exist; the New Shoe Blisters during the marathon itself; how the other runners and the crowds supported her in the '66 race, even if the organizers themselves didn't. Spread from The Girl Who Ran, showing Bobbi being confronted with her parents' objections. 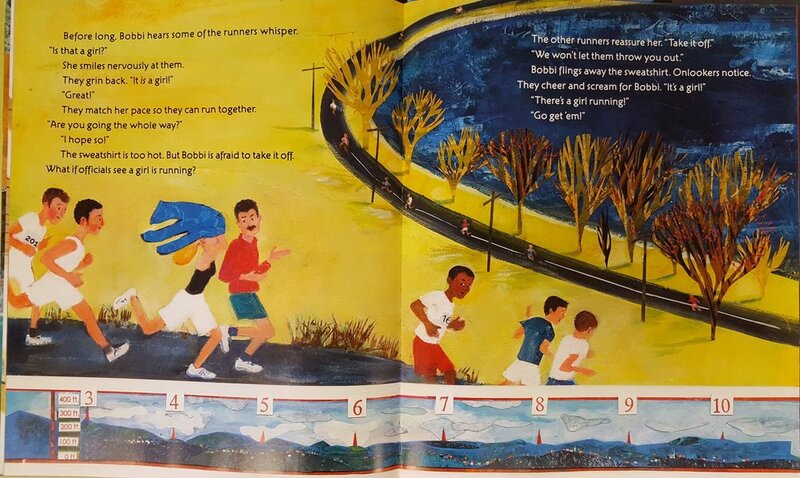 Spread from Girl Running, showing Bobbi being welcomed and supported by her competitors. Did those two spreads make me cry? Yes, they sure did. Seeing her co-competitors not only warmly welcome her, but actively support her, and then seeing the shared joy of the female onlookers, WELL. My Grinch Heart just got too big for my ribcage again. They're both solid books, but my heart belongs to the Pimentel: in large part because of the collage/cut paper artwork, which my pictures, as usual, do not do justice to—I especially love the landscapes at the bottom that track her progress—but also because, again, of the text's focus on the physicality and hard work of running. I'm not a runner AT ALL, but I have enormous respect for the dedication it takes, and Pimentel really captures that & makes you feel it. The Girl Who Ran, toot toot. I know, I know, I am apparently six years old but IT GIVES ME THE GIGGLES EVERY SINGLE TIME I LOOK AT IT.